Reducing, reusing & recycling water – super green super tips! | How can I recycle this? Reducing, reusing & recycling water – super green super tips! Following on from yesterday’s watery post, green blogger Crunchy Chicken has proposed a “Dry Humps” (as in camels) challenge for one weekend next month. She states that the average American individual uses between 100 – 176 gallons of water a day, whereas an average *family* in an African country only uses 5 gallons of water. The Crunchy one’s challenge is for people to cut down to 5 gallons a day (per person) for the weekend of the 12th & 13th June. Five gallons is 22.7ltrs, and as a guide, an average bath tub holds about 40gallons/150ltrs, and each toilet flush uses between 1.6gallons/6ltrs and 3.4gallons/13ltrs depending on whether it’s a new-fangled or old fashioned sort. So five gallons/22.7ltrs, per day, per person for a weekend really isn’t that much to live on – so quite an extreme challenge for us decadent water wasters, particularly at the height of summer. A number of people who are taking up the challenge have wondered aloud how they’ll do it and another set of people have said the challenge is too extreme for them but they’d like to cut down their water usage over permanently – so I thought it might be a fun idea to brainstorm some dark green super tips – or bright green water saving gadgets or ideas. We – the people switched on enough to read green websites – all know we should turn off the tap when we’re cleaning our teeth and to fill our washing machines rather than running them on water-wasting half loads. They’re the equivalent of “put on a jumper before turning on the heating” ideas for reducing heating bills/usage. But what are your favourite water saving hints and suggestions? Do you have any gadgets to reduce water flow? Has a pay-for-what-you-use water meter helped keep you focused? Do you use grey water (from baths, showers, washing machines etc) or stored rainwater to do anything fun? Have you hooked up any systems to automatically do that? What about in the garden? It’s getting warm out there now and I don’t know about you but my veggies are gulping it down already. Do you do anything in particular to make sure you’re using what you need but not being wasteful? And what about in the workplace? Have you encouraged your colleagues to cut down? Or seen any great water saving ideas in industry? I very much like the idea of tap aerators but haven’t tried them yet – they apparently cut down water usage by about 50% by spreading it out (like a showerhead does) rather than having it in one single heavy stream. Has anyone had any experience of them? Yes, I have them on all my taps. Works great and you’d never notice you were not getting as much water as before. I’d like to convert my garden sprinkler system to a drip system. Does anyone have any experience with this? I’d love to hear your story! Don’t water on windy days or during the heat of the day, you can loose up to 50% of your water that way. Water infrequently, deeply and thoroughly. This prevents runoff and encourages deeper root growth; plants with deep roots develop greater resistance to dry spells. In general,water should penetrate 4 to 6 inches down into the soil, which is the equivalent of 1 inch of water on the surface. …Measuring the amount of water that collects in a rain gauge will help you determine moisture needs. Or live in Scotland where it always rains. 100-176 gallons per person a day seems very excessive. I can only think of anyone coming to that if they have 3 showers (or baths) a day and take care of a very large lawn in a dry state like Arizona or (most of) Texas. But as an individual or family living in an apartment? I fail to see how that’s possible. For garden, there is are moisturizing granules. They expand when wet and help the plants maintain the water, so you can water your plants way less in amount and less often. I bought a 8 oz bag of that stuff for under $ 10 and it will last a few years in my garden in the balcony (with bigger stuff growing too, like bananas, tomatoes, and coffee). You can also use gray(er) water or rain water for plants. Don’t have a lawn. Unless you are in Ireland or somewhere where it rains and you don’t have to water it. But if you have to water it, a garden doesn’t need lawn. Plants that are more adapt to the climate you are in don’t need excessive watering as they should grow with whatever water is naturally available there. And the walkable, paved areas don’t need any watering. In US, I’d imagine the majority of that up to 176 gallons goes to water the lawn (as showering or using the toilet or drinking water is not much different in usage than in Europe). 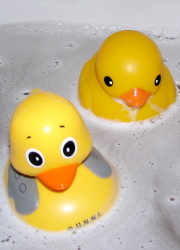 For other water usage… save bath water and have a bath with your loved one :) more fun and less water. Wear clothes, towels, and bedsheet a bit more before doing the laundry. If you ‘need’ to wash all shirts, jeans, towels and bedsheet after one day of use, either you have a bodily problem (BO – check the cause out) or you could probably reduce the wastefulness a bit. Does it look clean and not have a smell? It’s clean enough to wear. Drink tap water. As in, filter it if you like, and then keep in fridge or add ice. Water in plastic bottles or hauled in for your consumption from another continent is an overkill. Swim in an ocean, lake, or in a pool that isn’t just for your personal use (as opposed to having your own pool). I collect a lot of rain water in large vessels of around 200 litres. I’ve got 7 of them. 2 in the garden en the rest on different roofs of the shed and the house. The ones that are around 2.5 metres from the ground are connected two by two at the bottom, making communicating vessels, and one of the two is, also at the bottom of course, connected to a garden hose. The 2.5 metres give just enough pressure to use the garden hose to water the garden and especially the plants in pots. I know that collecting rain water is not very spectacular, but connecting it to a garden hose is really very convenient and makes that you use the rain water just as easily as tap water. could experience my “redneck luxury spa treatment” just one time, I believe you would never want to take another shower just to get warm! WARNING: water/steam and electricity together is courting DISASTER! I put the crock pot in the sink and direct the steam into the saunna with a LARGE homemade “stove-pipe” made out of aluminum foil. Please do not attempt this set up unless you are confident of your SAFETY!!!!!!!!! movie, and some popcorn. If you have ever spent the day walking barefoot on the beach then you know that the sand scours your feet as clean as a baby’s patootie, including all the nooks and crannies in between your toes, and all without any real effort on your part except moving your feet to get some friction goin on. If you cannot set aside two stinkin hours per week to chill out, and wash your feet, then please go to the nearest mirror and ask the person you see there: “Do you believe in life before death”? Life is short, live a little! Sorry folks, my sis had me lmao so the post mighta been confusing to ya. Put about 5 lbs of the sand in the dishbucket. Add vinegar (it kills bacteria and neutralizes odors and is non toxic) and a squirt of dishsoap. genious I tell ya!!!!! She says when you’re done cleaning your feet you can mix some of the stinky vinegar in the bucket with some salt and put it in a spray bottle and use it as a weed killer/herbicide instead of toxic poisons like Round-Up. She’s right. I pity the poor weeds!!!!!! haircut then get one! Shorter hair = less water use for maintenence. can I use steam for as opposed to a larger amount of hot water? Put a cup of water in the microwave for a long time—-for a steam cleaning. nut-job-outta-this-world-uber wacky ways to conserve water? toilet bowl and set it to work cleaning your porcelain throne… Don’t use your toilet all weekend! Pretend you’re camping, in the house (gives whole new meaning to “staycation”, don’t it?). Set up a WATERLESS port-a-potty (plastic bag in a bucket….just throw your waste away),or get some clumping cat sand and make a “litter pan”. Dry system. Why on earth would I even suggest these insane ideas, you ask? One good reason (of many) is just to test yourself for your capacity for adaptation in case you ever find yourself in an emergency situation. plumbing, and would not consider a plugged up commode a disaster. What do you do with all that water??? Give up using grey water … it is a health risk. I made a 5 metre well about 50cm in diameter and lined it with car tyres. We use it for toilet flushing, lawn watering and flowers. All the water we need is pumped out by an air operated pump with no moving parts (see article on reusing large gas bottles). The water is kept fresh using toilet blues which don’t harm the flowers or grass. 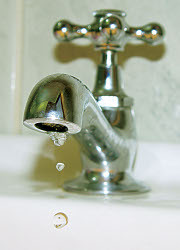 1/3 of all water used at home goes down the loo so you will make a bigger saving than just using grey water. After a few months the water flow will be fast enough to meet instant demand. If you safely recycle, well, wastewater (used euphemistically), and people call that gross, remind them that they do it on the ISS.